Utility Customer Service is responsible for timely and accurate billing for City of Brandon services, the collection of City revenues and requests for new, transfer or termination of utility service. All service related items can be completed both in person or online. Please read our Frequently Asked Questions for help starting or stopping service, paying your bill, understanding your bill, reading your meter, etc. The October 2018 Utility bill reflects rate adjustments. Each of the attachments describes in detail where these funds are being used and why the city of Brandon adjusted the rates. What are your business hours and phone number? The Public Works Department is open from 8:00 a.m. to 5:00 p.m. Monday through Friday, excluding holidays. During these hours customers can call 601-824-4579 to speak with a representative. Emergency teams are on-call 24 hours a day, seven days a week by calling 601-824-4579 during business hours and Brandon Police Dispatch 601-825-7225 for after hours emergencies. How do I establish a new water service account? Complete Application for City Provided Utility Service and provide a copy of a Photo ID and proof of ownership or copy of lease. This form can be submitted in person, by email to water@brandonms.org, by fax at 601-824-4582, or by mail. Acceptable proof of ownership can include a copy of executed lease, good faith statement, HUD statement, closing statement, or deed. New accounts require a $100 deposit. The deposit must be paid at time of application. Applications for separate sprinklers meters are made by using the same application. You do not need to come in person to complete an Application for City Provided Utility Service. Simply download the Application for City Provided Utility Service, sign and return to the water department via fax at 601-824-4582 or email water@brandonms.org. You will need to attach a copy of a Photo ID and proof of ownership. Acceptable proof of ownership can include a copy of executed lease, good faith statement, HUD statement, closing statement, or deed. A representative will enter the information into the system and contact you to arrange payment of the deposit. How do I request disconnection of my service? Please complete a Disconnection of City Provided Utility Service Form. This form can be submitted in person, by email to water@brandonms.org, by fax at 601-824-4582, or by mail. I am planning a move. How do I transfer my service? Services cannot be transferred. Please complete both an Application for City Provided Utility Service and a Disconnection of City Provide Utility Service Form. No, the deposit is due at time of application. No – The customer does not have to be home but they should make sure all faucets are turned off prior to leaving the residence. How do I make a payment over the phone? Payments can be made over the phone by calling 1-888-626-8998. How can I login and pay my bill online? Visit https://www.logicsolbp.com/brandon/login.aspx. You can create an account or make a one time payment using an account number. Account Number (Located in upper right hand corner of bill. Leave off the zero at the beginning of the account number, and the digits after the decimal point. PIN Number – Last four digits of social security. There is a convenience fee of 2.60% for all online payments. When making a payment online you will receive a confirmation email for your payment. If you did not receive a confirmation number then your payment did not process. Is auto draft bill payment available? Yes. Auto draft will electronically transfer funds on the 20th of the month from either a checking or savings account. Return the completed Bank Draft Information Form with a voided check. This form can be submitted in person, by fax at 601-824-4582, or by mail. Bills are mailed the around the 10th of the month and are due the 28th of the month. Bills are for previous months’ usage. Ex: Your June 10th bill is for the April-May reading period. What happens if I make a late payment or fail to make a payment? All bills not paid by the due date are subject to late fees or disconnection. The late fee is $5.00 or 10% (whichever is greater) per account and re-connection after disconnect for failure to pay is $40.00. Re-connection after hours is $80.00. You will be billed flat rate and usage charges on a monthly basis. Usage charges are calculated for usage used between your previous and present read dates as depicted on your current bill. Usage is billed per thousand gallons. Meters are read by the 1000 gallon. If you look at a standard residential meter, the last three digits on the reader are black. These digits are not read. When hundreds of gallons used turn into 1,000 gallons, a charge for 1,000 gallons is added onto a bill. For instance, a resident who regularly uses a little more than 2,000 gallons a month will occasionally have a bill for 3,000 gallons when a few hundred gallons accumulates and eventually adds up to a full 1,000 gallons. How many days are in a billing cycle? Generally, there are 30 days in a billing cycle. Depending on how dates fall, the billing cycle can vary by 1-2 days, although we try to avoid this if at all possible. What is a base rate charge? A base rate charge is a monthly service fee in addition to your charge for usage. This charge covers the cost of administration of water billing, meter reading, meter replacements, and expansion of the water and sewer system. Does the City of Brandon use Estimated Billing? No, the City of Brandon does not use Estimated Readings as general practice. As we pursue meter replacement, level billing will be used in cases where meters have stopped reading. Do I have to pay for sewer charges if I fill my swimming pool? No. Please fill out the Application for Adjustment Form and indicate filled swimming pool. This form can be returned in person, via email to water@brandonms.org, or via fax at 601-824-4582. The sewer related charges will be adjusted out. You will still be charged for water. I have had a leak repaired, what do I do? Have the leak repaired and fill out the Application for Adjustment Form documenting the type of leak, the repair, and proof of repair. This form can be returned in person, via email to water@brandonms.org, or via fax at 601-824-4582. A public works representative will process the adjustment and determine the appropriate adjustment if any. The adjustment process can take a month to three months. I believe I have a billing discrepancy, what do I do?? Billing discrepancies can be handled by phone or by email. Please include the name on the account, service address, account number, a description of the issue, and contact call number if submitting via email. Email requests can be submitted to water@brandonms.org. Please allow for up to 5 business days for our staff to research your issue. This time allows us to send an employee to read the meter manually to validate readings. How many adjustments can I receive per account? Customers are allowed one adjustment per 12 month period for water leaks. Customer are allowed one adjustment per calendar year for swimming pool fill-up. Adjustments are evaluated on a case by case basis. My bill often fluctuates by 2000 gallons, it this normal? Yes- When hundreds of gallons used turn into 1,000 gallons, a charge for 1,000 gallons is added onto a bill. For instance, a resident who regularly uses a little more than 2,000 gallons a month will occasionally have a bill for 3,000 gallons when a few hundred gallons accumulates and eventually adds up to a full 1,000 gallons. My bill is often the same amount each month, is this normal? Yes – Water billing is done by 1000 gallon increments. Your actual usage may vary from 5,001 to 5999 gallons per month, but the usage billed would be 5,000. The remaining gallons would be reflected on the next months reading. What does an average residential water bill rate breakdown look like? What does West Rankin and Sewer rate pay for? The West Rankin rate on your water bill represents the cost of transmission and wastewater treatment associated with sewer use. The City of Brandon is a member of the West Rankin Utility Authority (WRUA). WRUA serves the cities of Flowood, Pearl, Brandon and Richland, along with areas of the Pearl River Valley Water Supply District. The City of Brandon sewer system discharges into WRUA interceptors. WRUA interceptors carry Brandon, along with the other members’ waste water through a series of interceptors to the Savannah Street Plant. WRUA meters Brandon sewer flow at the connection to the interceptor much like the city meters water at a residential home. The city pays WRUA per volume passing through the interceptor. This fee is a pass through fee. WRUA is then is billed by the City of Jackson which owns an operates our regional waste water treatment facility for the amount of flow arriving at the facility. The fee covers both the cost of treatment and maintenance of the interceptor lines that carry the waste to the plant. The city sewer fee covers the cost of maintaining city sewer main lines and a series of 33 lift stations required to move the sewer to the WRUA interceptor. Nine out of ten times, the answer is inefficient plumbing. Toilet leaks and outside hose leaks cause most high bills. If you feel your water consumption is higher than it should be, you should check for leaks. Leaking water produces a high water bill without your knowledge. Some leaks are sporadic and require some detective work. Other leaks are very obvious. It doesn’t matter what type of leak you have, they both have solutions. Your water meter can be a valuable tool in detecting leaks. Some meter pits are full of water, this does not mean that you have a leak. It could be natural ground water. You may have to use a pump to remove the water from your meter pit or bail the water out with a small bucket. Make sure all water using fixtures in your home are not in use. Check to see if the triangle on the face of the meter is moving. It is a low flow indicator. If you have a digital meter screen look for the leaky faucet indicator. If it is, you either have a leak or something in your home is using water. Go find it! Places to look are toilets, faucets, hot water heaters, water softeners, etc. The sweep hand turns a full rotation when 100 gallons of water has gone through the meter. Wet spots in your yard between the meter base and your house. I think my meter is not reading correctly. What do I do? Meters can start to run slower as they age – the meters will never run fast and slow and fast again causing higher usage. The only way to have higher usage is to have water pulled thru the meter. You should evaluate for leaks, abnormal usage like swimming pool fill-up, irrigation, extended house guests, etc. Make sure that no water is being used at the time of the test (i.e. dishwasher, shower, faucet, toilet running etc.) Meter hand should be stationary. Meter leak indicator should be stationary. If leak indicator is moving, a leak is detected. Digital meters will indicate usage on the screen and have a small leak indicator that displays as a dripping faucet. Empty a 1 gallon container into the 5 gallon bucket 5 times and mark the top of the water level with a black permanent marker to determine exact level for 5 gallons of water in the bucket. Empty the bucket. 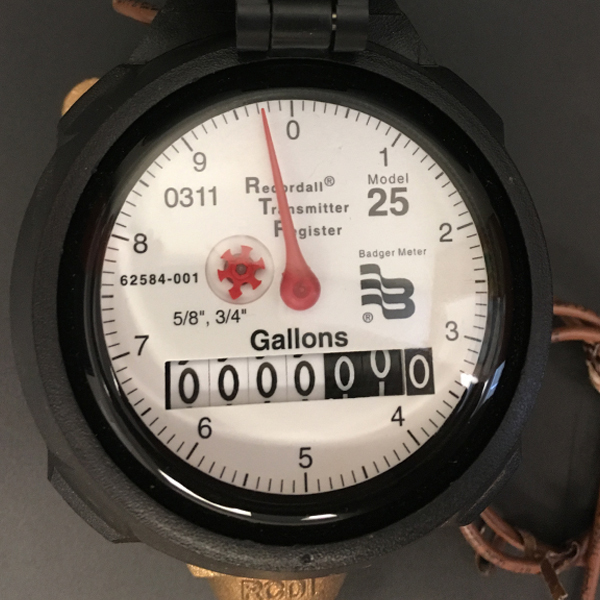 Run water from the hose bib until the sweep hand on the meter dial is located at “0.” If Digital, notate reading. Have one person stationed at the meter to monitor this sweep hand. Fill the bucket to the 5-gallon level and shut the water off. The sweep hand on the meter should now be located on the “5” representing 5 gallons of water has passed through the meter. If digital, an increase of 5 gallons should have registered on the screen. How does the City of Brandon read meters? Most City of Brandon meters are read via radio read. A public works representative will drive by each meter with a laptop that can read the meter automatically when in range. Some larger commercial meters are read manually. Meters are read by the 1000 gallon for billing. If you look at a standard residential meter, the last three digits on the reader are black. These digits are not read for the purpose of billing. Example: Meter reads 19,990 at the time our meter reader passes by. That months usage reading will be logged at 19,000. Readings will always occur in even 1,000 increments. This can cause fluctuations in low flow users bills and be the difference in a month with 1000 gallons and the next month reading 2000 gallons of usage. Determine if you have a mechanical meter interface or digital meter interface. Mechanical interfaces have a gauge and digital meters have a lcd screen. The large sweep hand on the dial measures water use in gallons. 1 gallon of water passes through the water meter as the sweep hand moves from one number to the next (e.g., 0 to 1). A complete rotation equals 10 gallons. 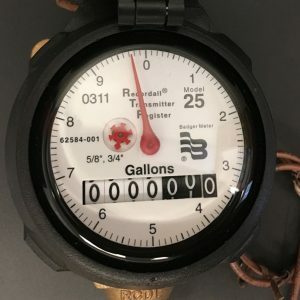 A complete rotation registers on the meter reading. The low flow indicator spins for low flow water usage. This can indicate a leak if this indicator spins while all water is turned off. The screen displays the readings in gallons. It will cycle through three screens. The extended visual read screen shows gallons down to two decimal places. The next screen will display Rate/Minute. The third screen displays the meter model information and settings. The digital meter also has status indicators for suspected leak. If you see a faucet with a drip displayed it is indicating that you may have a leak and should investigate further. This only displays if the meter registers 24 hours without one 14-minute interval of no flow. How can I identify a Brandon Public Works employee who comes to my home? All Brandon Public Works Employees wear a photo identification badge with a City of Brandon logo and are in vehicles marked with the City of Brandon logo. For your safety, always ask to see this identification before allowing the person into your home. Should someone posing as an employee refuse to show identification, please call 601-825-7225 immediately to report the impostor.